We are getting cabin fever, we decided to have a Polar Bear Run today and many children did not want to come in. 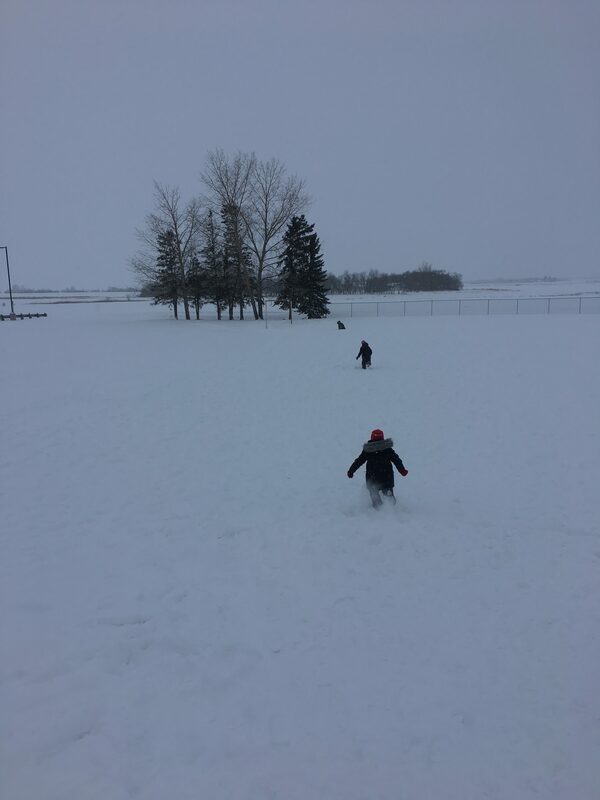 At 2:10 recess it was -26 so those that were dressed for the weather went out to enjoy the snow! We had so much fun! We will start a Polar Bear Club tomorrow. Those that are dressed and have parental permission will have the opportunity to go outside if they wish to. We had the pleasure of meeting Leah Dorion on Friday February 8. She came to share her new books. 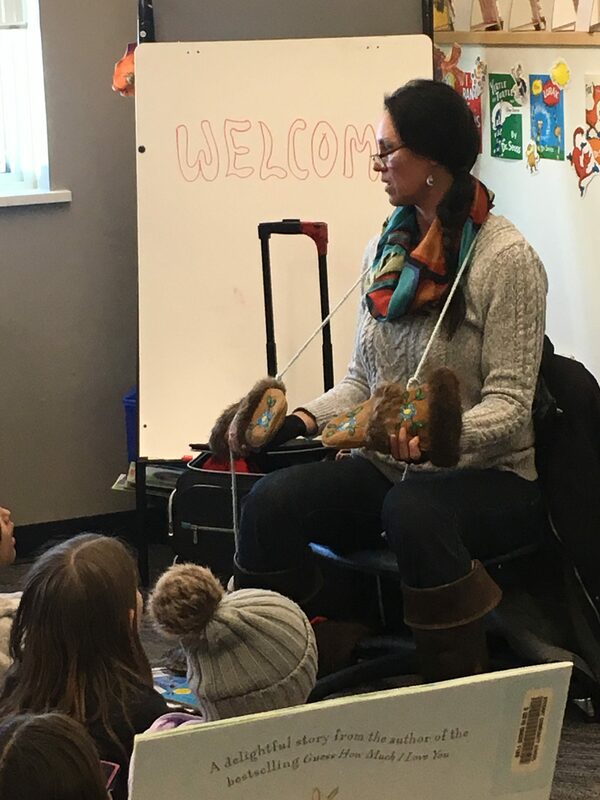 We had a wonderful time learning about Metis mittens, and how Metis Mothers carry their babies. Leah brought beautiful Metis mittens, a Moss bag and a special belt that is used to carry babies with a shawl. She also asked us many questions about her artwork, and then we had a chance to ask her some questions. We had a wonderful time. Thank you Wapiti Regional Library for supporting this author visit. We are looking forward to our Wapiti Ski Trip on Valentine’s Day this week. We are hoping the weather will cooperate! We will be leaving at 7:30 am and arriving back at school at 6 pm. Have a wonderful winter break. I hope you have a chance to play in the snow together!! Our students and staff would like to thank everyone who came to our Christmas Concert. It was a wonderful evening of music, drama and fellowship. Definitely a night we will remember always. The highlight being the song our students sang while encircling the audience (our families and loved ones). “Every day is yours, every day is mine, every day’s a good day when you’re by my side”. A true song of Reconciliation and unity. We wish everyone a year filled with all of life’s wonderful joys and success for all! On January 11th the author Richard Van Camp came to Stobart. Thanks to Northwest Regional College. We had the privilege of listening to him tell us funny stories with positive messages. He encouraged all of us to write and told us any of us can be writers. The grade 7-12 students watched the video representation of his graphic novel Three Feathers. Richard held everyone’s attention with his engaging speaking abilities. We enjoyed our afternoon very much! January is a month where teachers see a lot of growth in our students. It is often a time of great learning and focus. We are excited to see how our high school students do on their final exams and also how our elementary students progress in their core subjects of reading and math. Good Luck to all, and please remember to contact your son/daughter’s teacher if you have any questions or concerns. Stay warm! We held our annual Remembrance Day Service on November 8th. It was wonderful to have representatives from the Legion as well as the Reserves attend our service and help us remember those who fought for our freedom. We sent out progress reports on November 16th, with a computer glitch delaying some of the reports. We were happy to see so many parents attend parent teacher interviews. Thank you so much for coming to speak with us about your children/young person. We appreciate your support. The basketball and wrestling season is now underway and we are looking forward to cheering both teams on in the upcoming year. Our elementary school is busy preparing our Christmas Concert. Mark the date and time on your calendars: December 20th at 7 pm. Hope to see you there. The High School annual US vs. Canada hockey game is being planned once again for Dec 21. We are looking forward to Christmas fun in December. Stobart Halloween parade was a hit, as always! 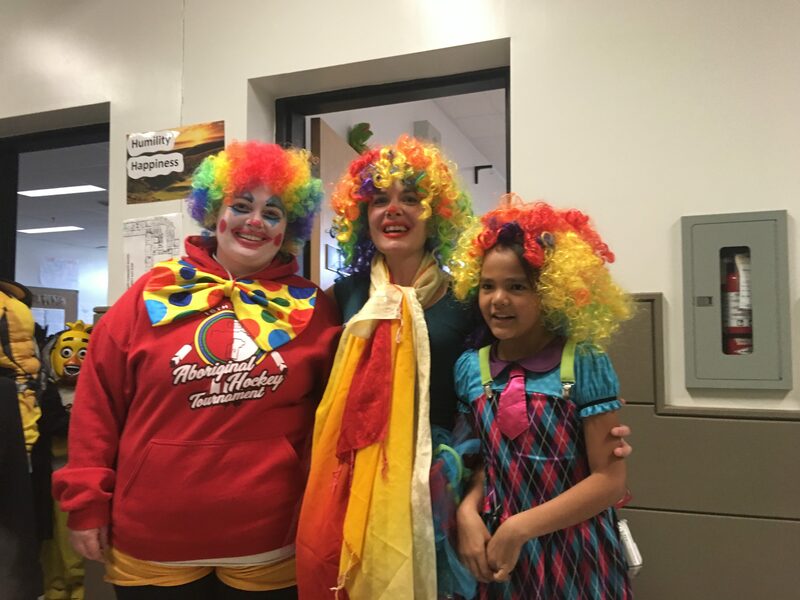 Thank you to our Stobart Community School Families for coming out to support our Halloween Fun Night that occurred on Oct. 22. We raised $1950.00! We will be using these funds for guest speakers, field trips, other special extra curricular events, as well as our year end swimming and park party! If you have any suggestions for guest speakers for our students please let us know. Thank you. After school programming has begun. We had 78 kids stay on November 6th. Thank you to our teachers and staff who volunteer their time to offer fun activities for the students! On Thursday November 8th at 10:30 am we will be having our annual Remembrance Day service. You are welcome to join us. We had a wonderful start to the new school year. We are grateful to all the families that attended our preK/K orientation night, as well as our entire school of families who attended the pancake breakfast. It was wonderful to catch up with all of you. 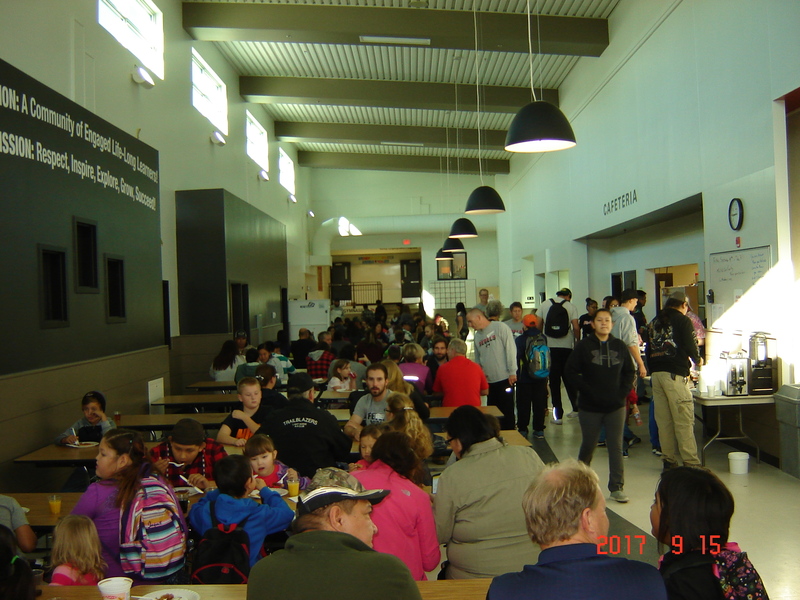 The grades 1-3 classes hosted a family potluck that was enjoyed by many families, once again thank you for coming. 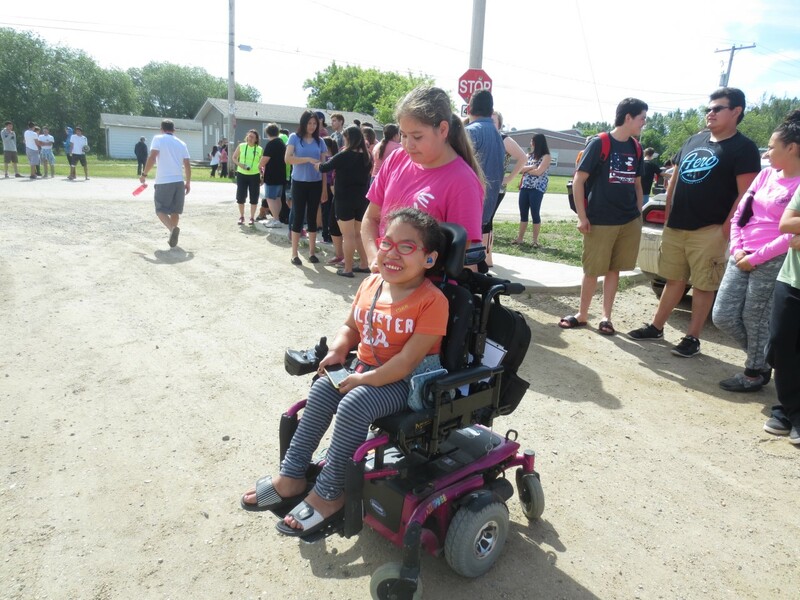 We held our annual Terry Fox walk on September 14, this year we walked through the community. We paired up the older students with the younger ones and it was a successful adventure. We harvested our school gardens and enjoyed a vegetable soup on the 21 of September. Thank you to our cooks for creating a tasty soup with the vegetables we grew. On September 28th we recognized Orange Shirt Day, many tough conversations were had that day. We will change the world with our inclusive, kind ideas! We also attended the town Cultural Workshops, it was a fun Friday! 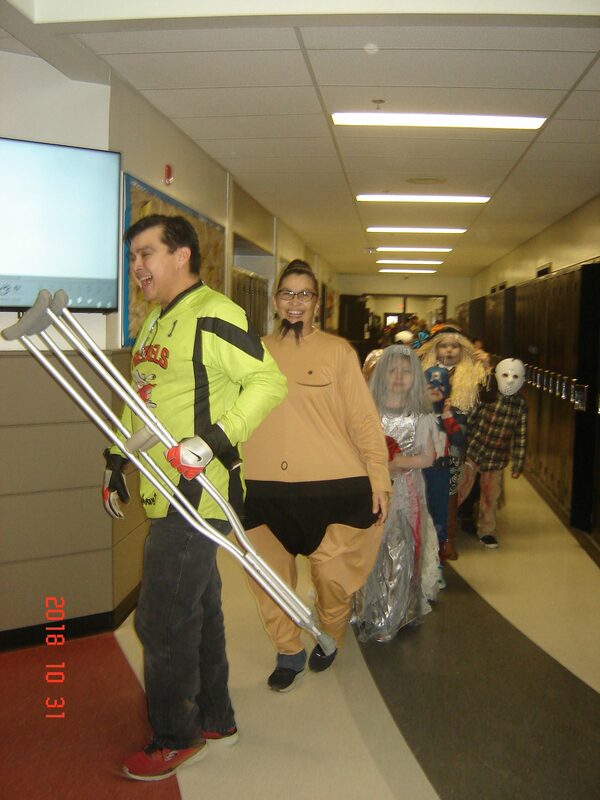 We are looking forward to our Thanksgiving meal this week, our Elementary Soccer tournaments, the Saskatchewan Cultural Exchange Workshops on Oct 17, our junior Girls volleyball tournament at Stobart on Oct 20, and of course Halloween Fun Night on October 22. We had a very successful walk-a-thon fundraiser. The students worked very hard and raised $5605!! 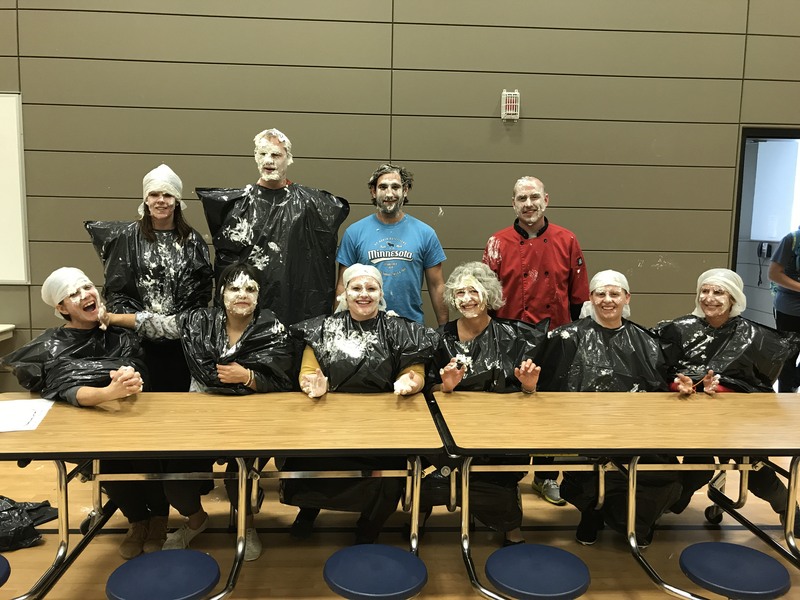 They were rewarded with fun activities like giving the teachers a make over and throwing pies at the staff! Thank you to our very generous Communities Duck Lake and Beardy’s & Okemasis! We are very grateful for your support. We will use the funds for our Wapiti Ski trip in Feb., to invite presenters to our school (we have invited Michael Linklater to present) and Chad Solomon (Rabbit & Bear Paws author) is coming with support from Wapiti Regional Library. We should be able to invite one more presenter and pay for our swimming/picnic to celebrate the end of the year in June. We had a Family Dance/Fun night on Oct 27th it was well attended and again generously supported!! 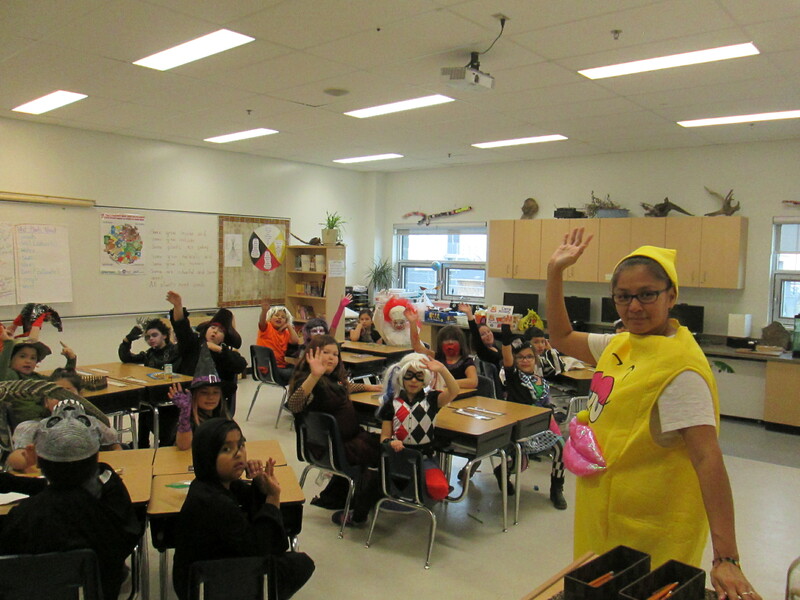 We wrapped up October with Halloween fun, movies, dress up, and Grade 6s made us a Haunted House! Our Remembrance Day service was held on November 9th grade 2 students sang O Canada in Cree, three High School students read In Flander’s Fields, two High School students played guitar while Mr. Don Crosson sang, we honoured many of our communities’ veterans through a power point and various art work. On November 17th our students received their report cards. We are proud of the work everyone at our school is doing. November 22 and 23 were our interviews. Thank you to everyone who attended! We’ve had a great start to our new school year. We had an awesome turn out for our preK and Kindergarten orientation, it was so nice to meet new students and their families. We also had a wonderful pancake breakfast where we enjoyed the food while catching up with one another. 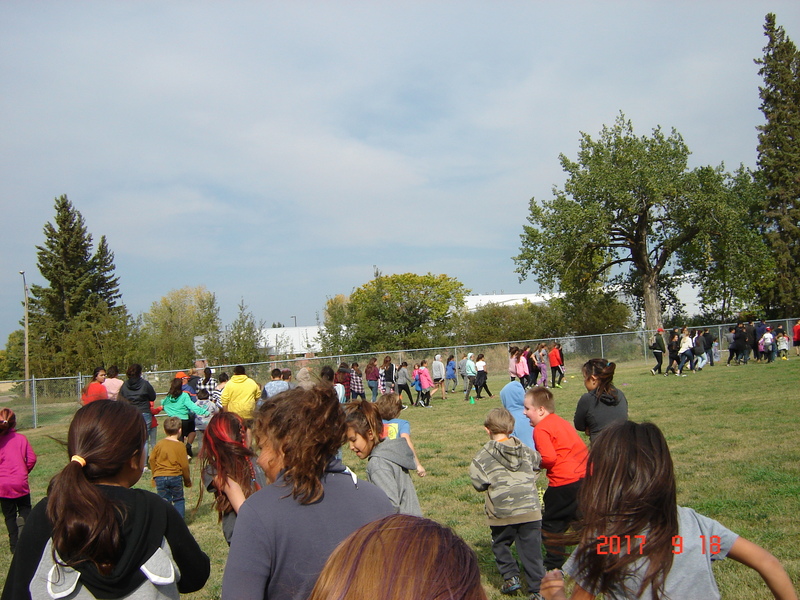 We all participated together in the Terry Fox walk/run on Sept 18th. We are keeping the tradition of raising money for cancer research at our school in support of all those we know who are affected by the disease. Our cross country team is doing very well in their events. Our grade 5 & 6 soccer teams are just getting started and our volleyball, soccer and golf teams for the High School are well underway. The High School Jr. Girls have a volleyball tournament at Stobart on Friday Sept 29. Please contact coaches for games and practice schedules. We are working on harvesting our gardens and will be eating harvest soup this Friday. We are learning lots and would love you to ask us about our school work. 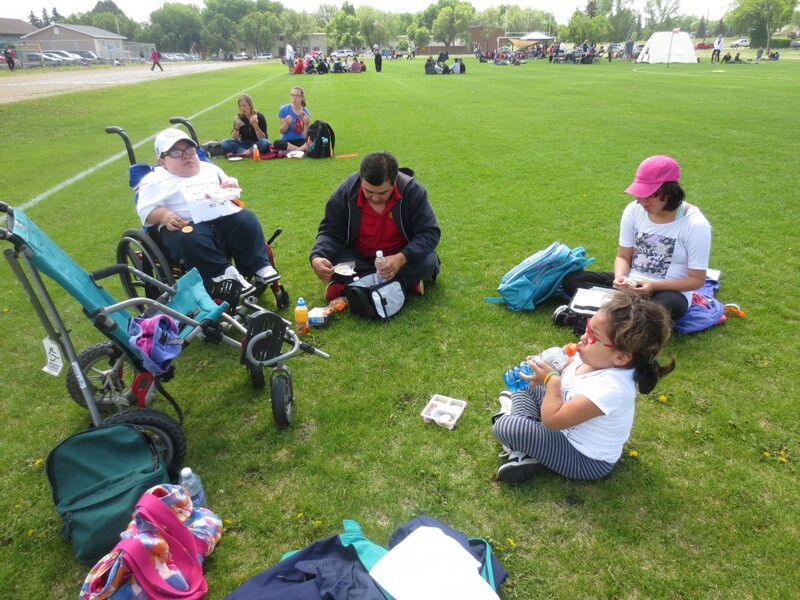 The students had a fun time swimming at Rosthern on Monday, June 20th. 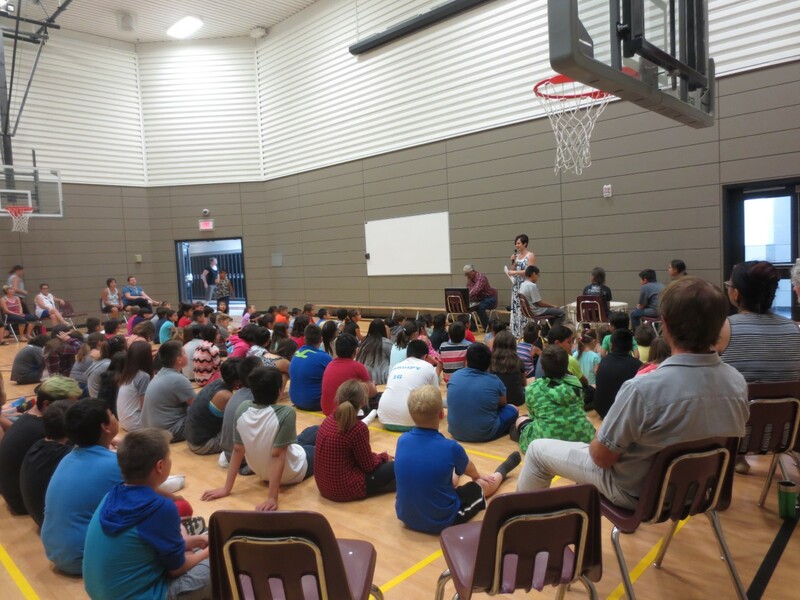 Aboriginal Day began in the mini gym with a prayer from Elder Herb Seesequasis. He gave the prayer in Cree and asked the others to say a prayer in their own language. Following this a group of boys did drumming and singing. Activities then took place. 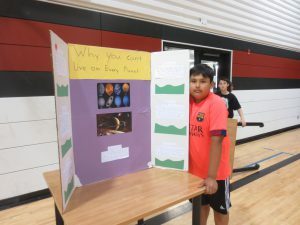 Some of the activities were bannock making, beading, birchbark biting, drumming, Powwow Dancing, jigging/dancing, Cultural Learning with Junior Eyahpaise & his wife, this took place in the Library. To finish the day off we all met in the big gym including the High School, to join together and dance. Thank you to Mrs. Heinrichs and all those involved in making this happen. Also thank you to those who did the activities, your help was greatly appreciated. Mr. Hand’s Grade 6 class held their Science Fair in the big gym on Wednesday, June 22nd. 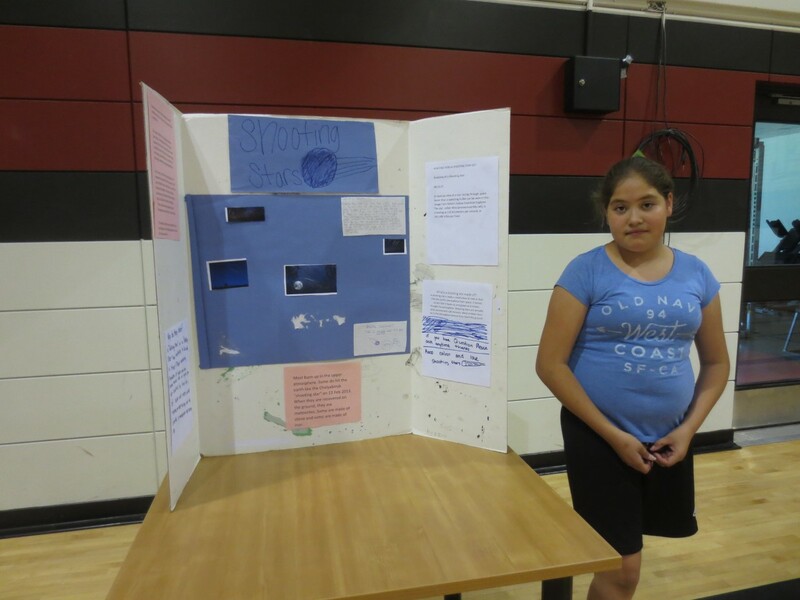 The students have been learning about the Universe and all things that pertain to it. 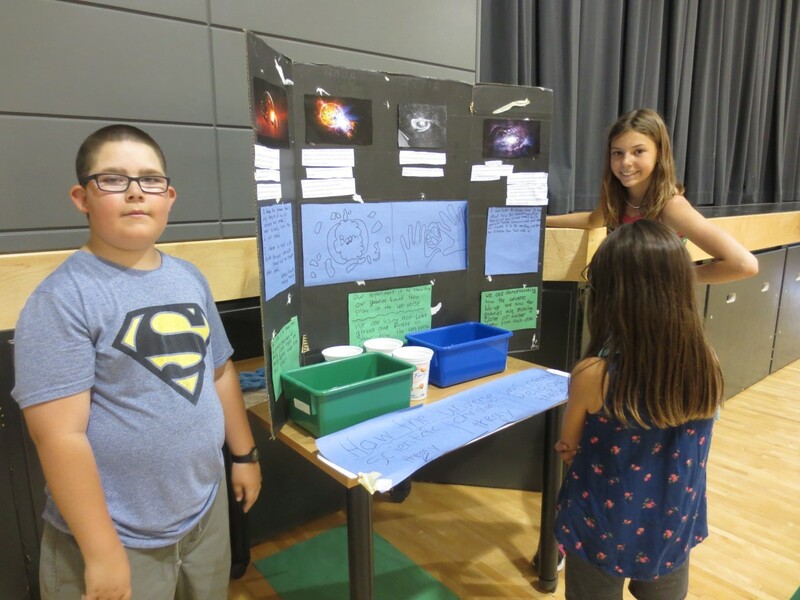 Classes came to see the displays and listen to what the students had learned about their project. The students did a very good job. High school exams started on Thursday, June 23rd and will finish for some on the 28th. Miss Braun held her Kindergarten Grad in the mini gym and Ms. Gagnon’s Grad was held in the big gym. They all joined together for lunch following the ceremonies. The children looked very cute all dressed up and wearing their caps. Congratulations Kindergarten! The students get to go to the Rosthern swimming pool today and then to the Valley Regional Park for lunch and a waterfight!! Today the Grade 1 – 3 students will go swimming from 9:30 – 11:00am and the Grade 4 – 6 will swim from 12:30 – 2:30pm. Have fun students!! 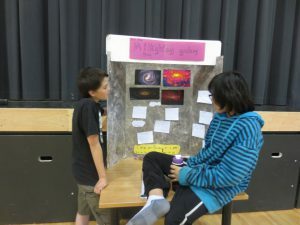 Tuesday, June 21st the students will take part in different activities to celebrate Aboriginal Day. The Grade 1 & 2 classes will be away on their field trip. PreK and Kindergarten will have their swim day on June 22nd. 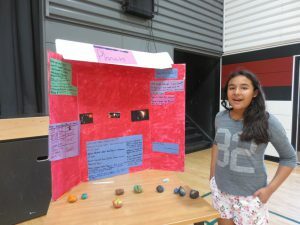 On Monday, June 13th the Elementary students gathered in the mini gym for the monthly assembly. 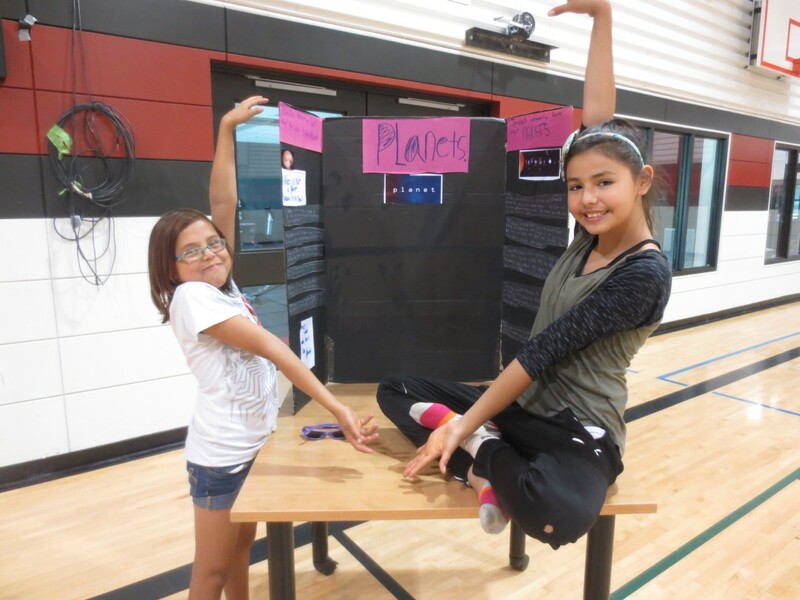 At the assembly the Grade 6’s were called up to choose a prize for doing the Take the Lead Challenge. 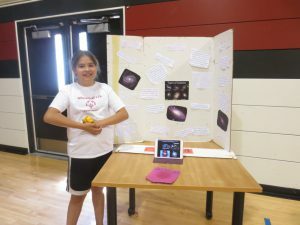 Throughout the year they did several activities to help out the younger students in many different ways and a big thank you goes out to them. Mrs. Gardypie’s Grade 3’s gave their presentation on their Tipi Teaching. Mrs. Heinrichs gave out the student Awards and seeing that there were only a few names in the buckets for the reading Mrs. Anderson said they would all get a prize. Mrs. Gunville called out the names of the SRC winners for the students who took part in the different activities during May and June. Staff and students of Stobart would like to thank the members of the Community who came out to the Award Ceremony and Community BarBQ on Thursday, June 16th. I will have a full report in next week’s paper. Also thank you to those who prepared, served and helped clean up at the BarBQ and to the janitors who cleaned the floors. Despite the rain Mrs. Enns Regier and her Grade 4 class enjoyed a terrific day at Batoche. The Kindergarten classes had their field trip on Friday, June 17th. It sounds like they had a lot of fun. The Grade 10 class spent Friday and Saturday camping. High School exams begin on Thursday, June 23rd and go until the 28th. Stay focused students and all the best on your exams! Mrs. Gunville’s Grade 3 class has their Class trip on Thursday, June 23rd. Kindergarten Grad will take place on Friday, June 24th. Grades 1 – 6 will go swimming on June 27th from 9:45 – 11:45 and then head over to the Valley Regional Park for Lunch and a water fight. June 28th is the last day for students. The Cosmotology Group of girls who went to MC College last Wed. reported they had a great day. Shireen had come back with her nails all painted black which she seemed pretty happy with. On Thursday, June 9th the school had a visit from a Para Olympic Group who had come in from Prince Albert and were on their way south. All of our students lined up outside to cheer them on as they left our parking lot. 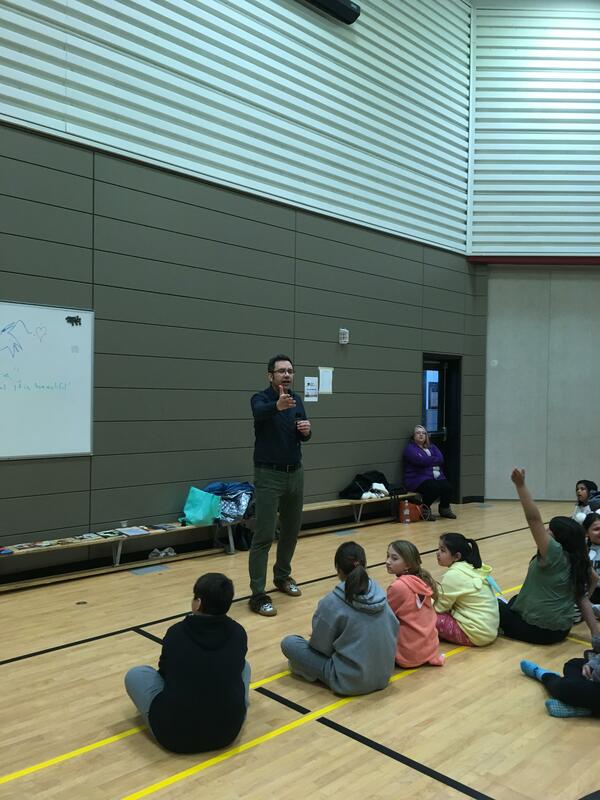 Our Elementary Students were greatly entertained by the Magician that we had come to our school. Students were very puzzled many times by how he managed to do things. When talking with Twyla Gamble about her placing at Provincials she told me she was pretty pleased with herself in that she had reached a higher level in the standings from the last time she competed. Congratulations Twyla! 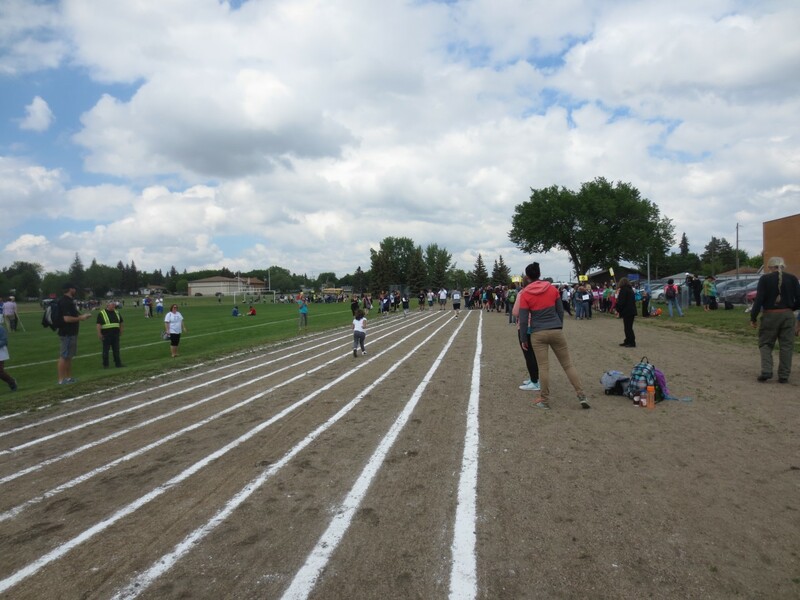 Our Grade 4 – 6 Track & Field students went to Districts last Friday, June 10th. There will be an Assembly today at 2:30pm in the mini gym. Mrs. Gardypie’s Grade 3 class will host. Time Travel for the Grade 6 Transition Day will take place on Tuesday, June 14th from 10:30 – 11:15. The students seem pretty excited!! PreK will go on their Field Trip on Wednesday, June 15th. Remember to come out to the Awards Ceremony and Community BarBQ on Thursday, June 16th. There will be a Slo Pitch game on Thursday, June 17th, this will be between some staff and the Seniors. Kindergarten went on their Field Trip today. Wildlife 10 Camping Trip will happen the weekend of June 17th to the 19th. Grades 1-3 will go swimming in Rosthern from 9:30 to 11:30 on Monday, June 20th and the Grades 4-6 will go from 12:30 – 2:30. 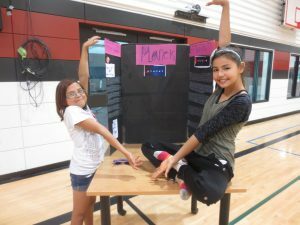 June 21st will see some activities happening at the school to celebrate Aboriginal Day. The Grades 1 & 2 will be gone on their Field Trip that day. June 22nd will see the PreK/K classes go swimming in Rosthern from 10 – 12. Mrs. Gunville’s Grade 3’s will be on their Field Trip that day as well. High School Departamentals and Final Exams will begin on Thursday, June 23rd and finish on the 28th. Kindergarten will have their Grad on Friday, June 24th. 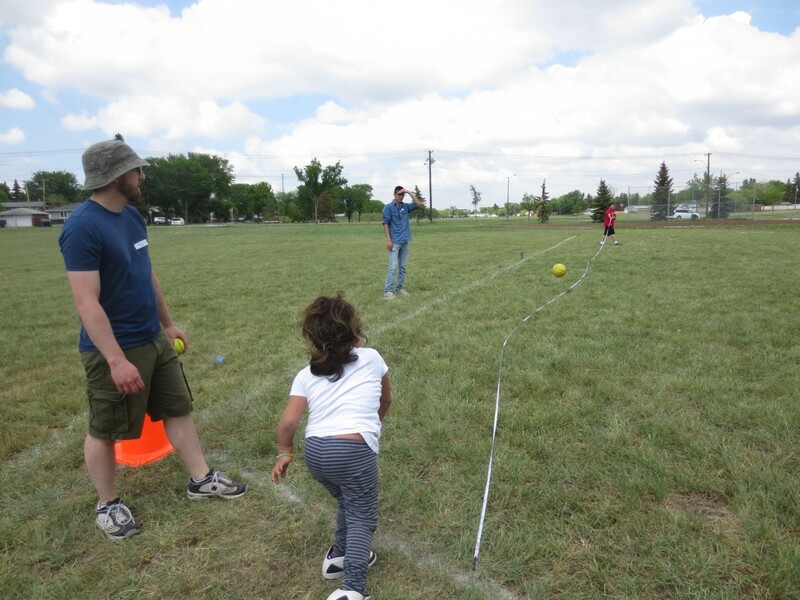 Monday, June 27th will see Grades 1-6 go swimming in Rosthern from 9:45 – 11:45 and following this they will then head to the Rosthern Regional Park for lunch and a waterfight!! June 28th is the last day of classes for the students!! Remember to get the eyeglasses or sunglasses in to have your name in for the $50 gift certificate draw. The Lions will be making the draw very soon. 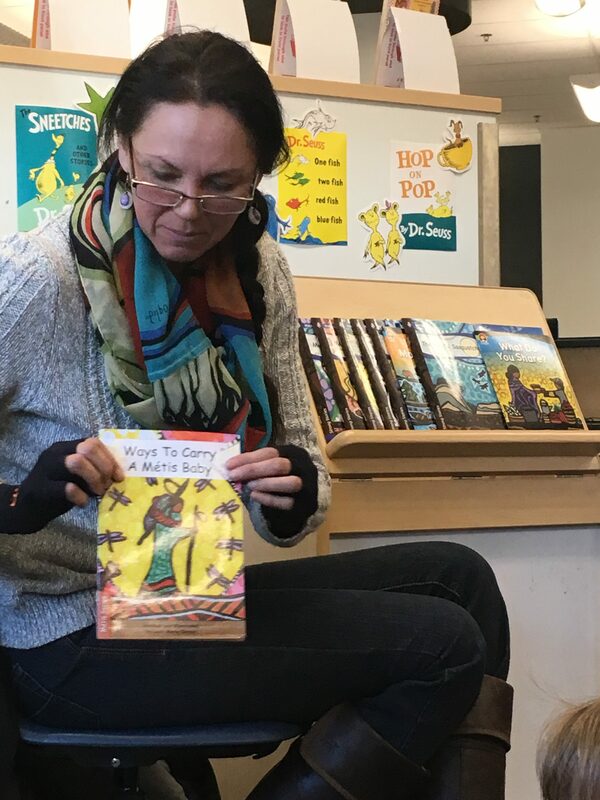 If you love to read and think you will have reading withdrawal this summer you can head over to the Wapiti Library and sign out a book to take care of the problem. The Library is open Tuesday & Wednesdays from 12 – 5pm. Their Summer Reading Program will start Tuesday July 5th and goes until Wednesday, August 24th. Story Hour will take place on Wednesdays from 2 – 3pm starting Wed., July 6th and will finish on Wed., July 24th. The Library will also have Lee & Sandy Paley perform at the Regional Interpretive Centre on Thursday, August 11th at 2pm. If you need any more information you can call Mrs. Perrin at 306-467-2016. 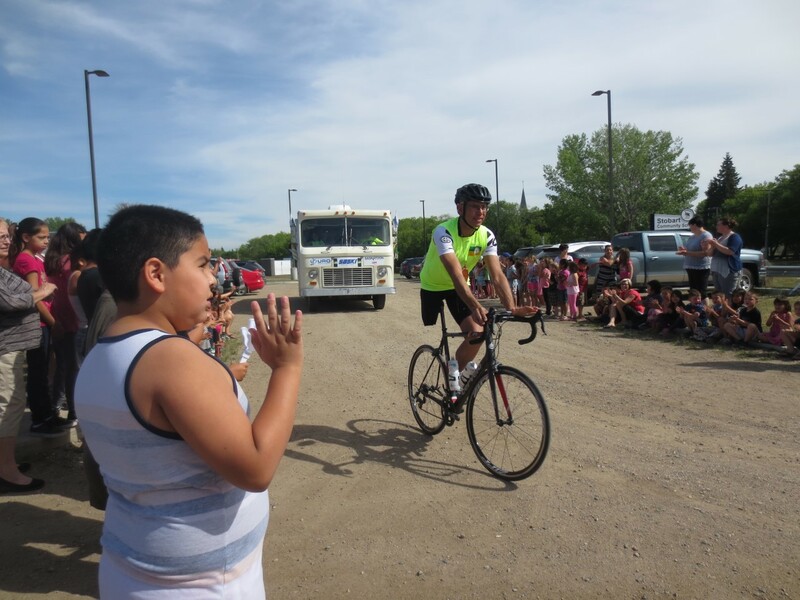 The total raised from the Take a Student to Lunch Fundraiser was $200. This just about made enough needed for the Grade 5/6 classes to go to Camp Kadesh. They were $11 short so the school kicked in that little extra. 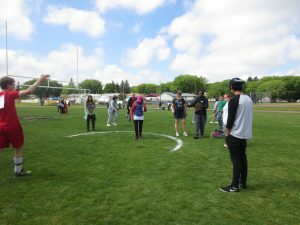 On May 25th three Elementary and two High School students took part in the Special Olympics in Saskatoon at the ED Feehan School. As the students proceeded into the gym students from the school lined up to cheer the contestants on. 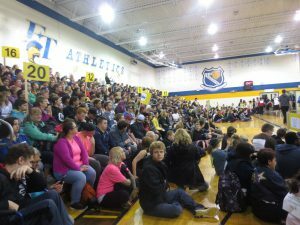 The gym was filled with I believe 333 contestants plus dignitaries, teachers, EA’s, volunteers, and parents. There was definitely not much floor space left. After the Opening Ceremony the contestants then went outside to go to their event that was on their schedule. Some of the events were soccer kick, shot put, standing long jump, running long jump, ball throw, 2 running events, and a couple of other events that we didn’t have time for. With the amount of contestants there was quite a lot of waiting in line time, but the students had fun and that’s the main thing. 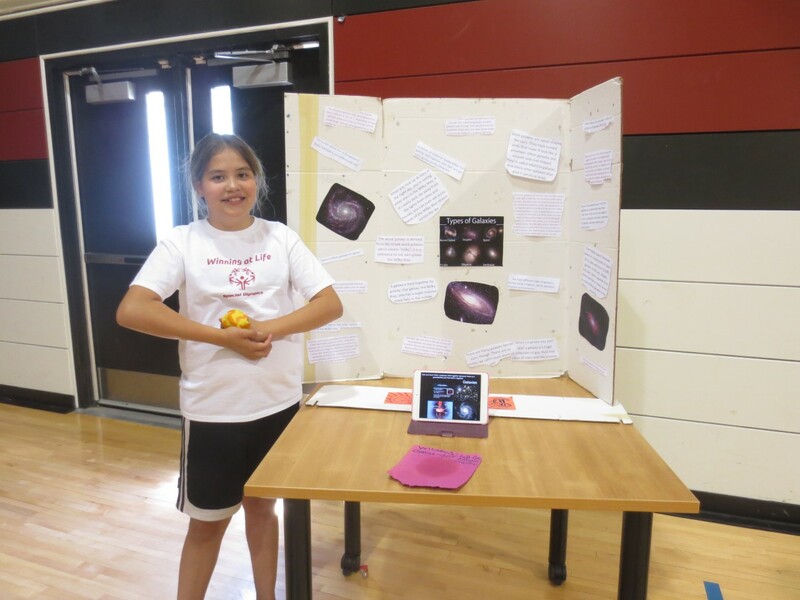 Congratulations to Twyla Gamble on her win in discus which earned her a spot at Provincials this past weekend. Mrs. Mievre’s Cosmotology Class will go to MC College in Saskatoon on Wednesday, June 8th for the day. A Magician will be at school on Thursday, June 9th to entertain the PreK to Grade 6 classes at 1:30pm. Mrs. Garydpie’s Grade 3 will have their Assembly on Monday, June 13th at 2:30pm. PreK will enjoy a field trip on Wednesday, June 15th. Remember to come out on Thursday, June 16th for our Annual Award Ceremony and BarBQ. The draw for a $50 gift certificate will take place this month so be sure and get those eyeglasses and sunglasses in that you no longer need. 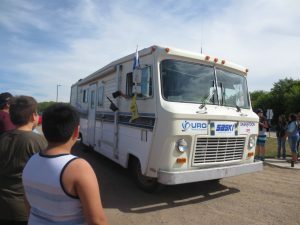 You can bring them into the school, or drop them off at the Town Office or Regional Interpretive Centre. We wish the Grade 12 students all the best as they Graduate this Friday, June 10th. Have a SAFE and FUN FILLED GRAD. Remember to FOLLOW YOUR DREAMS! You can accomplish anything you set your mind to! On Thursday, May 19th the Kindergarten classes had a Family Literacy Day. They received several donations of books which the teachers would like to thank everyone for. Parents and the children gathered in the Library where the students were then able to select books for themselves. Because of the amount of donations each student was able to take home an extra 2 books. Families then gathered in the Kindergarten rooms for some activities and snack. The students were able to get all their garden boxes planted as well as another garden in the fenced area. Hopefully the plants all grow well. Congratulations to the 12 Graduates of the Adult Ed Program. They held their Ceremony & supper on Friday, May 27th. This Thursday & Friday the Grade 5/6 classes will spend camping at Camp Kadesh. Have a fun & save time students. 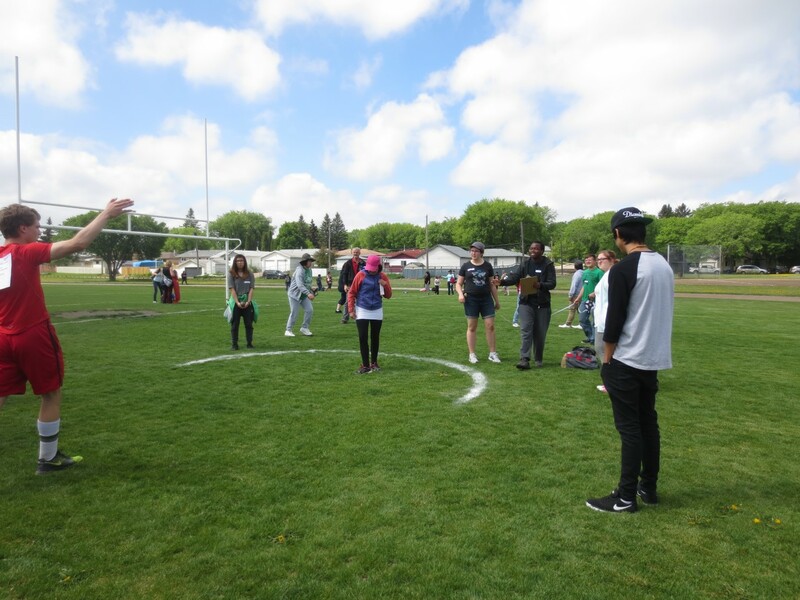 Students from Grade 7 – 12 taking part in the Track & Field will go to Provincials this weekend in Regina. June 7or 8th (depending on the weather) will see the Grade 4 – 6 students go to Rosthern to take part in Track & Field. A Magician will be coming to Stobart to entertain the Grade PreK to Grade 6 classes on Thursday, June 9th at 1:30pm. High School Graduation will take place on Friday, June 10th. The Community is invited to the Annual Awards Ceremony and BBQ on Thursday, June 16th. 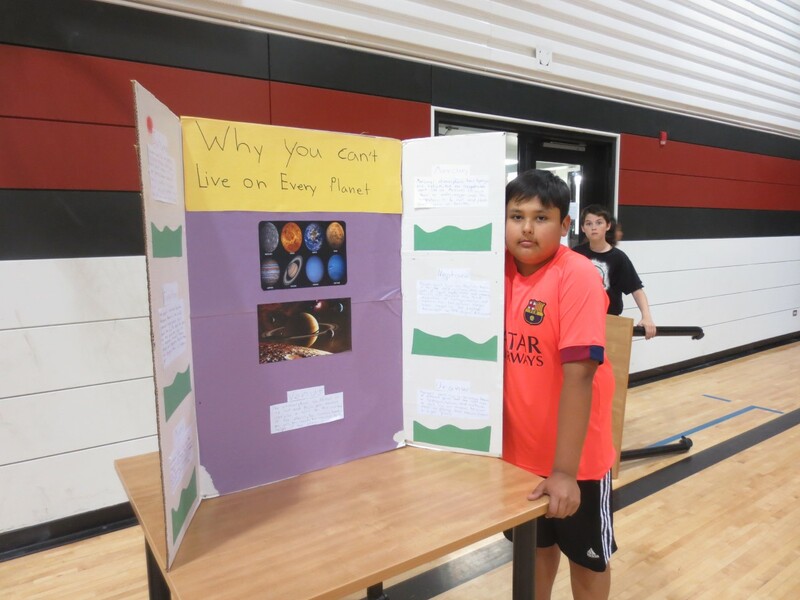 Mr. Wieler – Lakeishia Grade 10, Mr. Hand – Jorja Grade 6, Mr. Gallernault – Malachi Grade 5, Mr. Johnson – Ayden Kindergarten, Mr. Lanovaz – Marik Grade 7, Ms. Hildebrand – Naomi, Mr. Davis – Danis Grade 2, Mrs. Regier – Kaleb Grade 6, Mrs. Zacharias – Ashton Kindergarten, Mr. Freeden – Blake Grade 3, Mrs. Fredrickson-Gamble – Tyler Grade 4, Mrs. Enns Regier – Daylin Kindergarten, Mr. Gunville – Tommy Grade 2, Mrs. Bihun – Lily Grade 3, Mr. Pilon – Sienna Grade 3, Mrs. Heinrichs – Trayden Grade 1, Mrs. Johnstone – Austin Grade 5, Mrs. 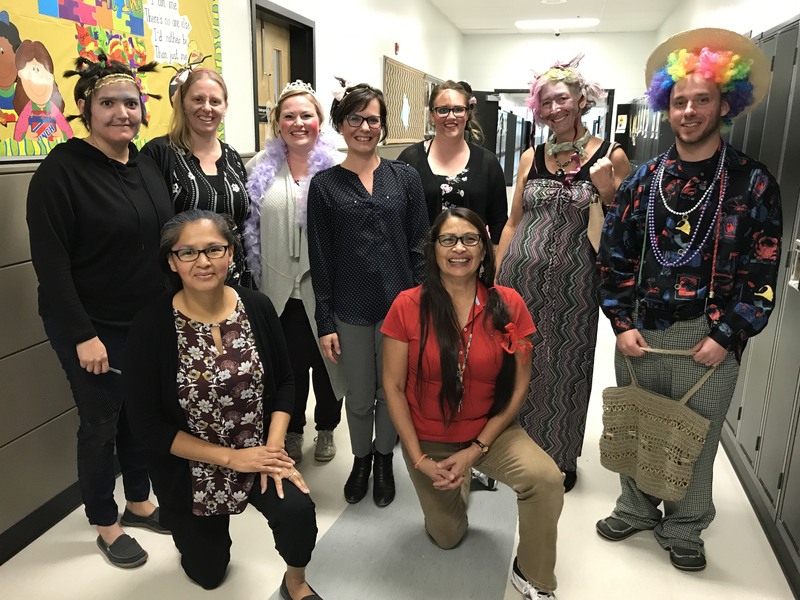 Darling – Saris Grade 1, Mrs. Anderson – Melaysia Grade 5, Nurse Gayle – Katelyn Grade 6, Ms. Laroque – Kashtin Grade 4, Mrs. Gunville Danika Grade 3, Mrs. Bisson – Autumn Grade 2, Mrs. Werschner – Sydney Grade 6, Mrs. Thorpe – Serenity Grade 6, Nurse Paula – Chenille Grade 6, Mrs. Mievre – Sienna Grade 4, Ms. Bardal – Shireen Grade 11, Mr. Bennett – Mya Grade 4. Thank you to everyone who supported this Fundraiser.